As highlighted by my earlier post on Co2, having sufficient Co2 is important for most planted tank. That’s why I’ve decided to share a basic guide on Co2 setup. Carbon dioxide plays a vital role in the health and management of your aquascape – no matter which aquascape style you decide to create. As one of the key components in photosynthesis, carbon dioxide is essential to the growth and stability of the plant life in your aquarium. In a natural setting, aquatic plants would ingest most of their CO2 through the substrate provided by mud or decaying plants in their area. In an aquarium, the level of CO2 is much lower because the substrate imitates a natural landscape and there are fewer decaying plants in the area. This imbalance often leads to problems with the health of your plants and, as a result, many aquascapers have found great success in supplementing their aquariums with additional CO2 to assist their plant life to grow stably in the aquarium. The process of setting up this CO2 injector requires many different moving pieces; however, the long-term benefits are quite clear in creating a much healthier and stable aquascape. There are numerous tools and pieces required for a proper c02 setup. Below is a brief list and description of the required equipment. Carbon dioxide comes in numerous sizes, similar to how a propane tank is sized for a grill or camp stove. The larger the bottle, the more CO2 it will contain and, in general, purchasing wholesale will assist you with the long term cost. Solenoids act as a system automation tool that will disable the injection of your CO2 based on a timer. This brings value to your CO2 system because it allows the aquarium to be more self-sufficient. For example, when you’re away from home and unable to turn off the CO2 injector, the solenoid will disable the injection for you. 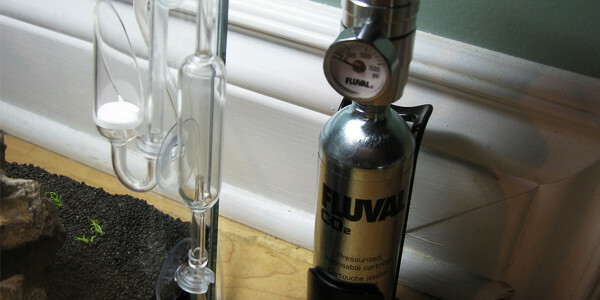 The bubble counter is a metric tool that allows you to quantify the CO2 that has been pushed into your aquarium. The diffuser is the tool that inserts the CO2 into your aquarium. Typically, the diffuser is a porous material that injects CO2 into the tank through a fine mist of bubbles. 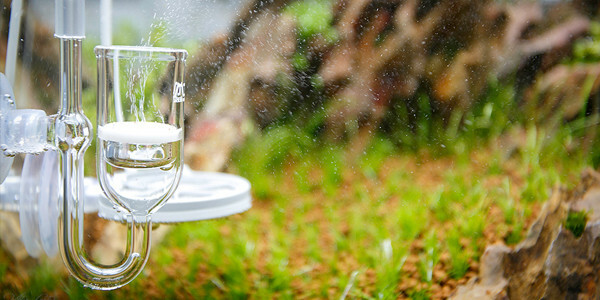 The diffuser’s main purpose is to equally disperse the CO2 gas throughout your aquarium water so that it is more effectively absorbed by the entire aquascape. While fairly straightforward, one aspect to keep in mind is to use tubing that is CO2 tolerant. The drop checker is a color-coded gauge that measures the concentration of CO2 in your aquarium water. As opposed to the regulator or bubble counter that measure the rate of injection, the drop checker gives clear insight into the CO2 saturation in your aquarium. This is a key component in the system as it provides insight on the health of the actual tank. Too much CO2 is usually considered to be unhealthy for your fish, whereas too little will not facilitate plant development. Use a drop checker to understand where your aquarium falls in that spectrum. Generally, there are two approaches to the implementation of a CO2 injection system – DIY system and Pressurized system. Moving to a pressurized system is more common amongst larger tanks of 40 gallons or more. The pressurized system also holds more opportunity for key metric observation and automation through the Solenoid tool. The implementation and management of your CO2 system is unique to the requirements of your aquarium, however it is of vital importance to also consider the other elements your aquarium requires such as light and fertilization. Finding a balance between each of these aspects is the key to a successful and healthy aquascape. Good luck! What is a CO2 Diffuser and What is its Purpose? How to compute the bubble per second in bubbe counter base in the size of tank?